I was so excited to receive this as I use John Frieda’s Sheer Blonde Go Blonder Controlled Lightening Spray every time I wash my hair. It came in a small travel sized bottle which is awesome because now I can keep refilling it and take it traveling with me. I travel all the time so it will come in handy. 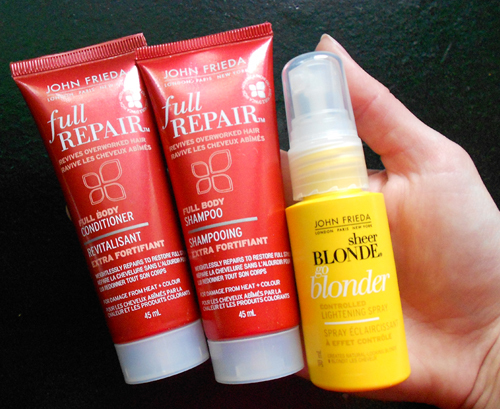 You can watch my video review on John Frieda’s Sheer Blonde Go Blonder Controlled Lightening Spray here. I haven’t tried their full repair products yet but am excited to and I will let you know how I like them. I’ve never been disappointed with anything in their line so I’m sure I will love the full repair shampoo and conditioner as well. How did I get these free samples you ask? I joined the John Freida Elite Club. You can join it too, it’s free and all you do is fill out a quick questionnaire about you and your hair. Join the John Frieda Elite Club today! I did notice that this club is only for Canadian residents. I wasn’t able to find one for the USA. I did however find the club for the UK, you can join The John Frieda Elite Club in the UK here. Today I received another box from John Frieda with another product inside. The John Frieda Elite Club sent me a deluxe sized sample of their Full Repair Style Revival Heat-Acitivated Styling Spray. I was not expecting to get another package from them and was super excited to get it. The package also came with a $5.00 off coupon if I buy two products from their Full Repair line. I will definitely be using the coupon because I really liked the Full Repair Shampoo and Conditioner. I think the John Frieda Elite Club is definitely worth signing up to. I wonder if they will send me any more products? I am already totally impressed by what I’ve received already. No other club I have been joined to has ever sent me free products before like the John Frieda Elite club. Today I received another box from John Frieda with a deluxe sized sample bottle of their Frizz Ease 3 Day Straight Styling Spray. I like getting these little bottles because they are great for traveling! I already have a full bottle of this product and never find myself using it. I will have to use the spray a few times to see how I like it. I have used it about once but I don’t find myself ever leaving my hair for 3 days before washing it. Also, I do not really have a problem with my second day hair staying straight. It is usually more relaxed the second day.